Pack your toothbrush and extra socks people, it’s time to hit the road! We are going on tour with Cloud Cult. In addition to my job at Soul Flower designing apparel graphics and running the print shop, I am also the merchandise manager for indie rock band Cloud Cult. We print all their eco friendly t-shirts and other merch items right here at Soul Flower. I thought it would be fun to let you see a bit of what it’s like to be on the road through my observations and interviews with the band. The members of Cloud Cult are a diverse group of musicians who create some of the most beautiful and uplifting songs I’ve ever heard. 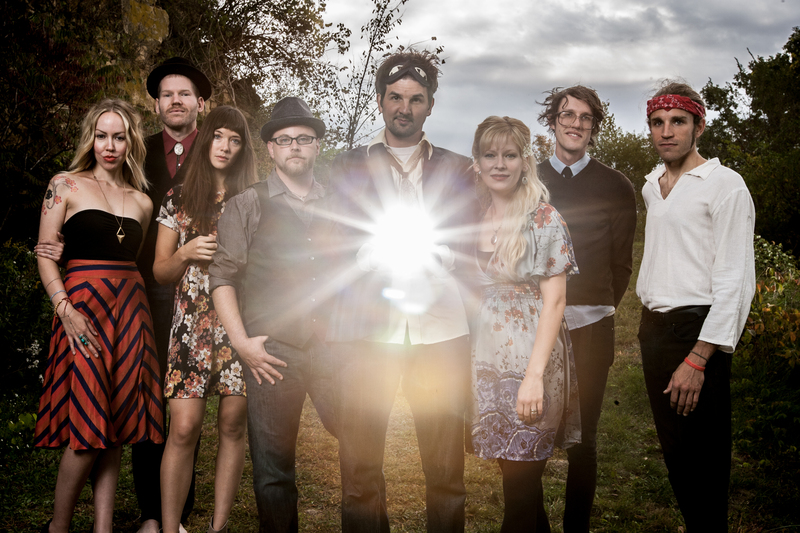 Cloud Cult began as Craig Minowa’s solo studio project, and over the course of ten studio albums the band has grown with an evolving lineup of musicians. Cloud Cult has received accolades including MTV, New York Times, Entertainment Weekly and has had several albums at the top of the college radio charts. They’ve declined major record label deals in favor of staying independent. Rolling Stone ranks Cloud Cult in the Top 10 greenest bands. My own involvement with Cloud Cult began when band member and live painter Scott West and I began working together many years ago. We quickly became friends, sharing a love of art, music and Mexican food. It’s been a real pleasure joining the band on road and sharing the adventure as they spread good vibes around the country. This tour is going to take us down South. 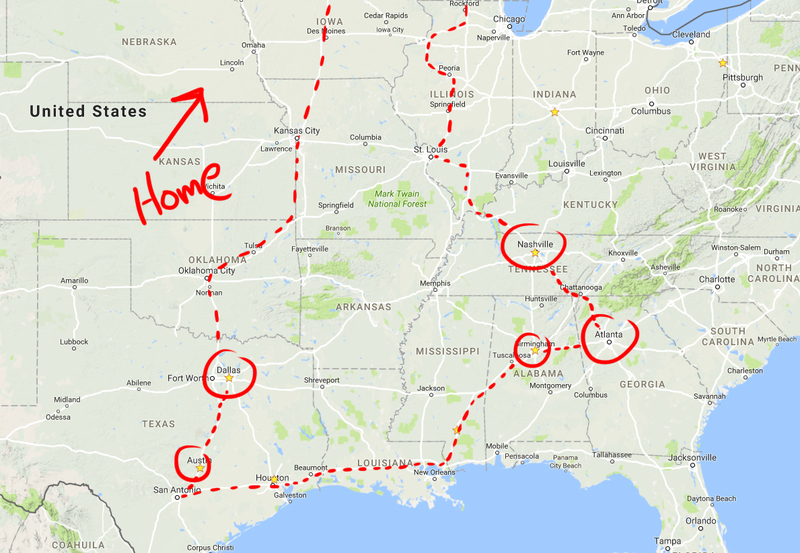 Nashville, Atlanta, Birmingham, Houston, Austin and Dallas. Cloud Cult hasn’t been down south since they played South by Southwest back in 2008 so there are a lot of fans excited to see the band live on stage. The Van and all the gear is going to leave a few days early and meet us in Nashville. Sunday Night. 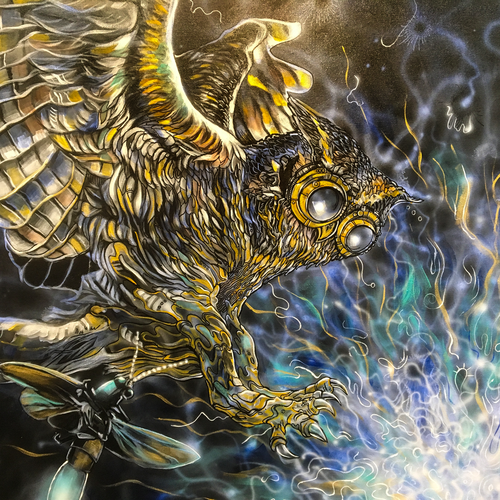 I meet up with live painter Scott West on Sunday night and we take an Uber to the Airport. We are flying into Nashville from Minneapolis. Since the band members are spread out between Wisconsin and Minneapolis, about half of us will fly down and the other will drive down with the van and gear. It’s quite the production getting everybody’s travel plans coordinated. Craig and Tour Manager Jeff do a great job keeping everybody on schedule and making sure we have a place to sleep every night. Woke up early on Monday and took a run around south Nashville. After a few months of Minnesota winter, this weather feels great! While I was running through the university campus I noticed some cool old school posters on the events board. 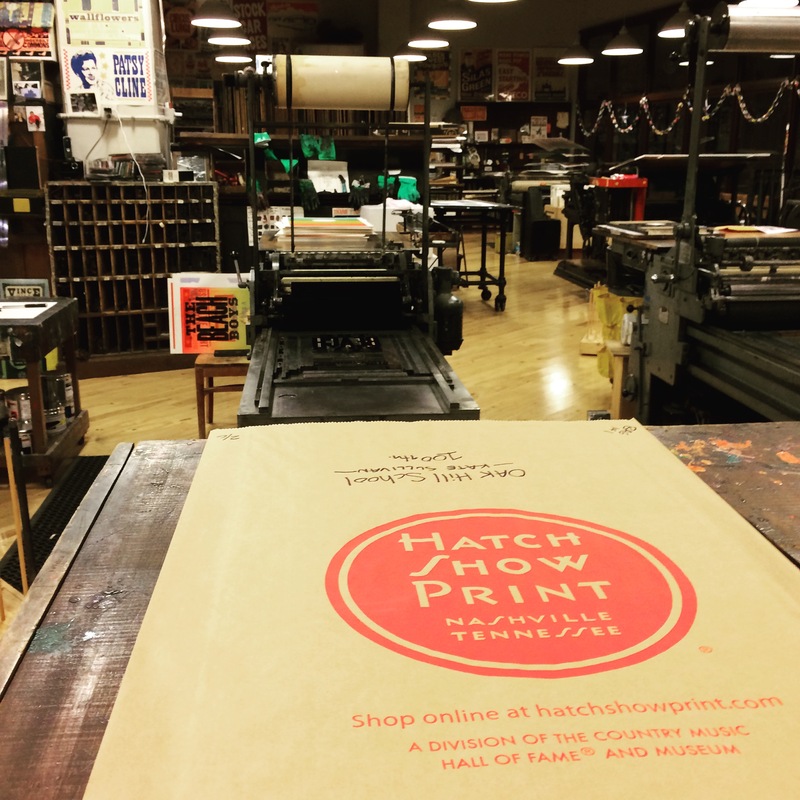 I remembered that Hatch Show Print, a really famous Letterpress shop was in Nashville. I plan on heading over there later but first, FOOD. I’m starving and pretty darn sore after my run. 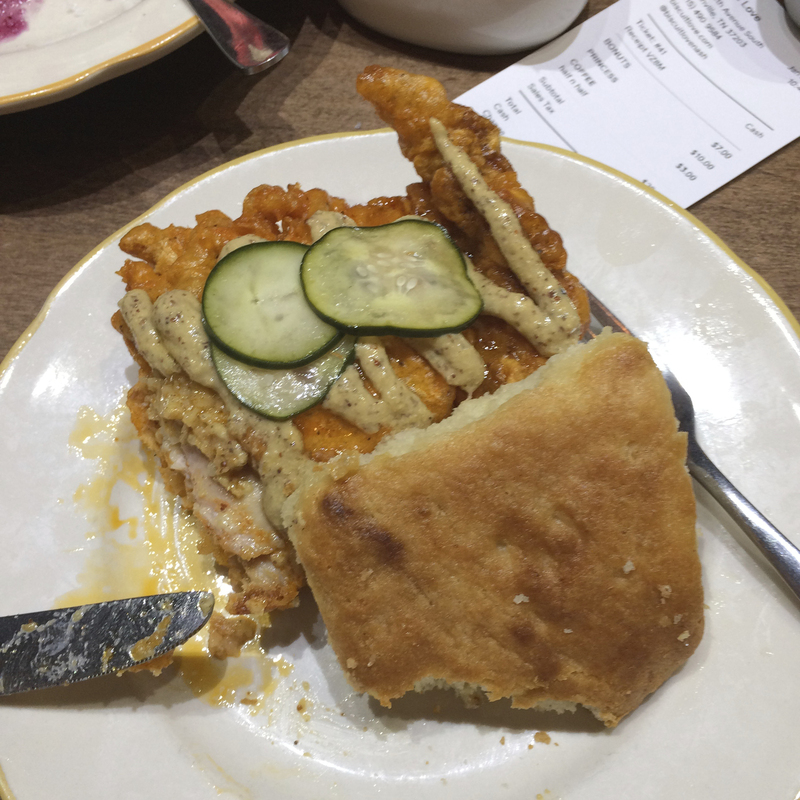 Southern cooking has always been a favorite of mine, we headed to downtown Nashville and had Breakfast at Biscuit Love. Seriously amazing. I probably don’t have to eat for the rest of the day. Sooo Full. Next stop, Hatch Show Print. 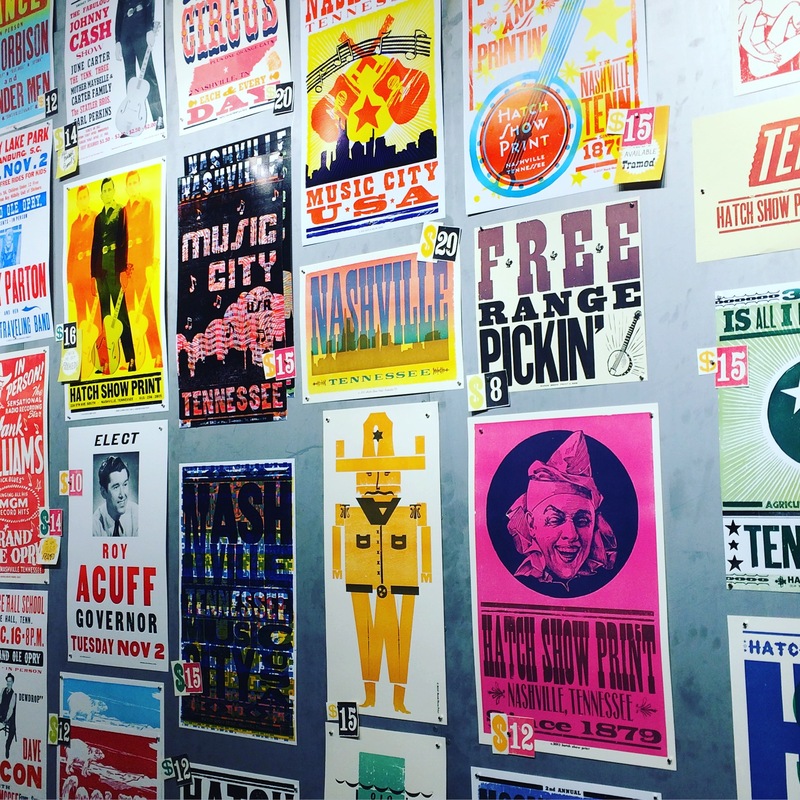 Since Nashville is a Music Mecca, it’s no surprise they also have an amazing art and design scene. Hatch Show Print was started in 1879 and has produced letterpress posters for pretty much every act you can think of. Screenprinting has been a huge part of my life since I was in High School so being able to visit Hatch was a dream come true. It was really inspiring to be able to tour the shop and by actual copies of some of the posters I have been wanting for so many years! Since Scott and I work in art and design, we take every opportunity to visit art museums and take in the local art scene when time permits. Much of my inspiration for new Soul Flower designs comes from art and experiences I have on the road. Nothing is more inspiring then getting out into the world and experiencing new people and places. 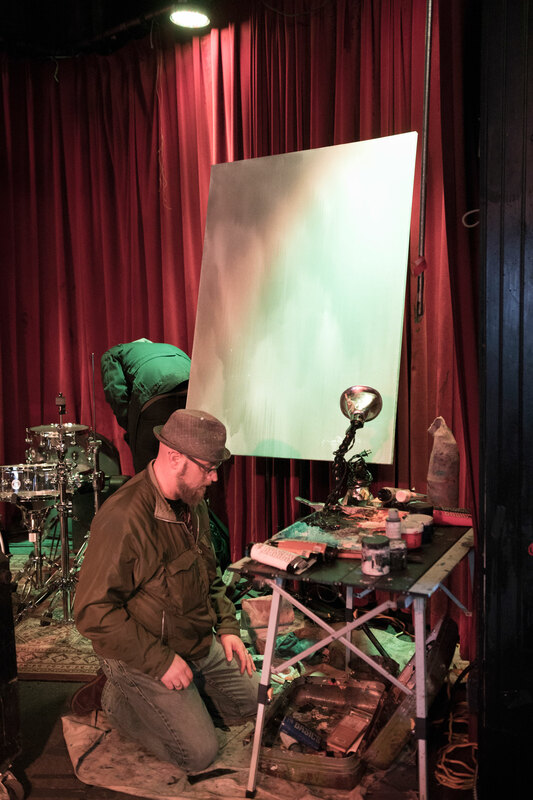 One of the unique aspects of Cloud Cult live show is the addition of two Live painters that complete a painting each night over the course of the show. These paintings have become highly collectable with fans and are auctioned off every night after the show. I sat down with Scott and asked him a few questions about being in the band. R: How long of you been live painting with the band? S: Since around 2000. 17 years. 35 paintings a year. R: How do you go about deciding what you’re going to paint every night? R: Do you have any advice for people who want to get into an artistic or musical career? S: Don’t stop. Don’t be discouraged. It takes a long time to grow your skills in any art form. Practice your craft every day and acknowledge the progression you are making no matter how small. Those small steps forward will add up to big advances over time. R: Cloud Cults music speaks a lot about positivity and how staying positive can help you through hard times in your life. Does this have an effect on what you are painting? S: Quite often at shows, people come out who are going through very difficult times or a personal struggle. The music and lyrics are putting out a positive message about how to cope with the difficult times and get back to the back to the good ones. When I paint I try and show a little bit of that struggle and conflict, but also where the light is. R: Has the positivity always been part of the bands message? S: It has evolved over the course of the band. In the earlier music there was more of a sense of struggle and dealing with that struggle. The band has gone through some difficult times over the years and found the light at the other side and that has been reflected in the later music. Many fans have taken the same journey with us so there is a sense of struggle and renewal in the songs that we get to share with the audience at shows. 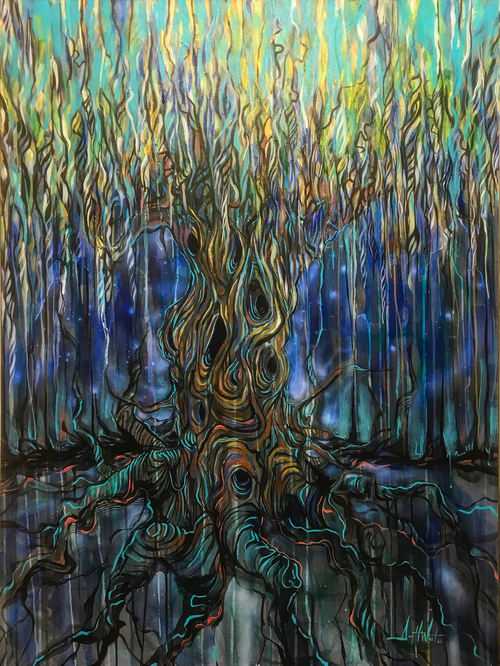 After graduating from the Minneapolis College of Art and Design in 1996, West spent many years as an illustrator and art director, as well as painting onstage with the indie rock band Cloud Cult. At the beginning of 2010, he left the commercial world in order to focus on touring and painting. 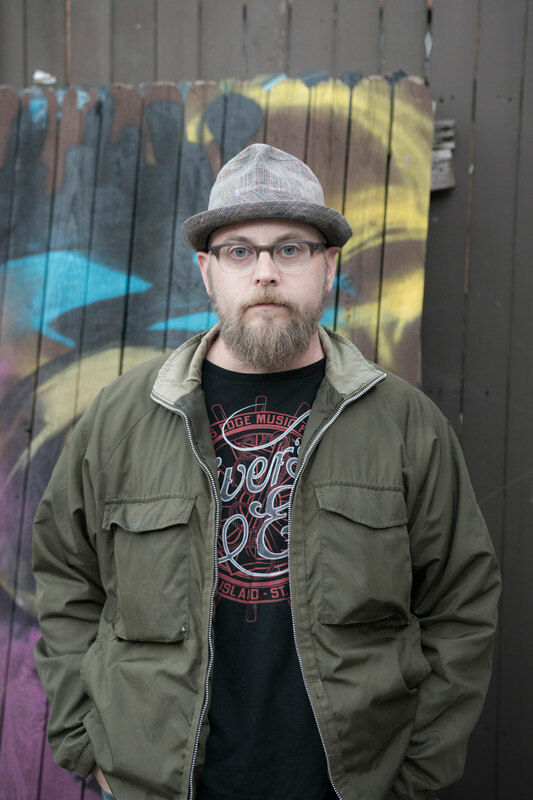 That time spent working commercially honed his technical skills while performing with Cloud Cult built confidence in the immediacy of his gestures, so that West’s canvases capture the dynamic passion of live music with skilled composition mixed with the openness to happy accidents and abstraction. West’s work has been seen by thousands of people from stage and he has exhibited internationally.. Wonderful story and interesting interview. Wow. I really dig this group, how they honor our humanity. I am tickled for Ryan to have this chance. As an artist, I have been asked to live paint and am excited to bring the energy of the music into my work. Thank you for bringing them to my attention!